Provide comfort for the family of Paul Jamison with a meaningful gesture of sympathy. Paul C. Jamison, 83 years of Hillsboro, passed away Saturday, January 5, 2019. Paul was born in Adams County, OH. on April 19, 1935, the son of the late Ralph and Blanche Marie (Barr) Jamison. Beside his parents, Paul was preceded in death by three sons, Paul V., Anthony “Tony” and Keith Jamison; one brother, Everett Gene Jamison. Paul served his Country in the U.S. Army during the Korean Conflict. He was a member of the Hillsboro VFW Post #9094. Paul retired from the Ford Motor Company. 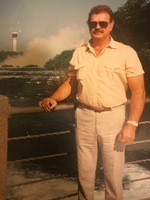 Paul is survived by twin daughters, Sharon Gae Posey and Karen Fae Jamison both of Hillsboro; seven grandchildren and several great grandchildren; aunt, Ruth Frye of Georgetown, OH. ; two nieces, two nephews, cousins and a host of friends. Private Funeral Services will be held Friday, January 11, 2018 at the Wallace-Thompson Funeral Homes, Bradford-Sullivan Chapel in Winchester, OH. Burial will follow in the Winchester Cemetery with Military Graveside Rites provided by the Adams County Honor Guard. Family suggests memorials to the American Cancer Society. To send flowers in memory of Paul C Jamison, please visit our Heartfelt Sympathies Store.